As of now, the deadline to comply with Real ID requirements is October 10, 2018, although an extension will likely be granted to states and territories that will not be able to make the deadline, but are making satisfactory progress toward meeting the absolute final deadline of October 1, 2020. There is already one U.S. territory that has missed a deadline - American Samoa - which means that their residents already have to comply with Real ID requirements when flying. On February 5, 2018, American Samoan residents were required to bring a federally-acceptable form of ID with them in order to pass Transportation Security Administration (TSA) checkpoints at airports - their American Samoa-issued driver license or ID card would no longer suffice. Between February 5, 2018 and May 6, 2018, TSA will provide assistance to American Samoan residents who arrive to board their flight without proper ID. Many states are already compliant with Real ID regulations, meaning residents of those states do not have to worry about being unable to board an airplane using their state-issued identification. Once October 10, 2018 arrives, residents from states and territories that are noncompliant with Real ID regulations and have not been granted an extension will need to use a Federally-accepted identity document, such as a passport, to board an airplane. To be clear: You can always use federally-issued identification instead of your driver's license to board an airplane for domestic air travel, but if your state is not compliant by the deadlines mentioned above, using federally-issued identification will be your only option at that point. Starting October 10, 2018, residents of states that have neither Real ID-compliant nor were given an extension must present one of the following identification documents in order to board an airplane for domestic air travel. What can you use as identification instead of your state-issued driver's license or identification card? (Federally Recognized) Tribal-Issued Photo I.D. Exactly what IS Real ID? RealID refers the the Real ID Act that was passed by Congress in 2005. The purpose of the Real ID Act is to follow the 9/11 Commission's recommendation that the standards, such as security standards, for issuing identification, such as state-issued driver's licenses, needs to be set at the federal level. Additionally, the Real ID Act stipulates that identification that does not meet Real ID standards will not be accepted by Federal agencies, such as the TSA (Transportation Security Administration), as a valid proof of identity. While states had originially had a deadline of October 10, 2017 to meet the requirements of the Real ID Act, they were given a grace period until January 22, 2018. Recently, many of these states and territories were given an extension until October 10, 2018 - American Samoa being the sole exception. You can keep up-to-date with all Real ID annoucements by the Department of Homeland Security (DHS) here. In which situations does the Real ID Act apply? In which situations does the Real ID Act not apply? How does Real ID affect YOU? As a resident of a state within the United States, the effect will be that you will have to get a new driver's license or identification card. But if you're a resident of either Illinois, Louisiana, Michigan, Missouri, New York, or Rhode Island, you may have already received your new Real ID-compliant driver's license or identification card and don't have to further worry about the effects of Real ID. Residents of all other states will need to get a new Real ID-compliant driver's license or identification card once the state is ready to issue them. Don't like going to the DMV because of the crowds? You're unfortunately going to have to brave going to the DMV within the next year or two. How does Real ID affect businesses? For businesses that require a form of identification to be presented for certain transactions - for example, a car rental agency that requires the presentation of a driver's license in order to rent a car - you can expect to have to spend a good chunk of time re-training your employees on what state-issued driver's licenses and identification cards are supposed to look like. 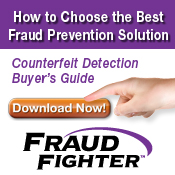 The worry for businesses, however, isn't necessarily the time it takes to re-train employees - it's about the fact that the flurry of updating all state-issued identification documents will surely, in turn, cause a flurry of identity fraud. Criminals will most likely take advantage of the fact that many businesses will need time to get used to the design of the new driver's licenses and identification cards, by using this transitional period to get away with identity fraud as much as possible. Not only will they take advantage of the fact that, for the new designs, not all employees will right-away be able to discern between a real driver's license and a fake driver's license, but also the fact that the old designs - the designs that criminals have gotten used to producing, and producing well - will be phased out soon. This wouldn't be as big of a concern if it weren't for the massive amounts of data breaches the past several years. Take the recent Equifax data breach, for example, that compromised the sensitive, personal identity information of 145.5 million U.S. consumers. In the absolute worst-case scenario, this means that criminals now have 145.5 million identities that they can use to wreak havoc at businesses all across the country. For as little as $50, a criminal can have a fake driver's license or identification card manufactured that has stolen, but real identity information. Consider the car rental scenario: A 'customer' presents a driver's license in order to rent a car. The card looks real, but perhaps the employee does a quick search of the name online to see if this person seems legitimate or not. Chances are, an online search will show that this person is indeed real and likely resides at the address shown on the driver's license. And so, the customer is given a car to rent. But the reality is that this 'customer' paid only $50 to obtain a fake driver's license (with REAL identification information) and now has a CAR that cannot be traced back to them - only to the victim whose identity was used. 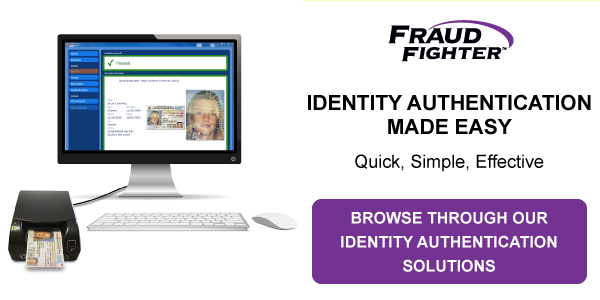 You can bet that situations such as that will occur much more frequently in the wake of Real ID regulations - if your business requires identification for certain transactions, you should take steps to protect your business from identity fraud as soon as possible.